Let me address each point. First, I have about 4000 users in my active two lists. I have about 10,000 users I could target right now thanks to various efforts – none of them nefarious – but I prefer targeted emails to carpet bombing. I sometimes break out the big guns when I have a big announcement. These are a few of my latest email blasts. 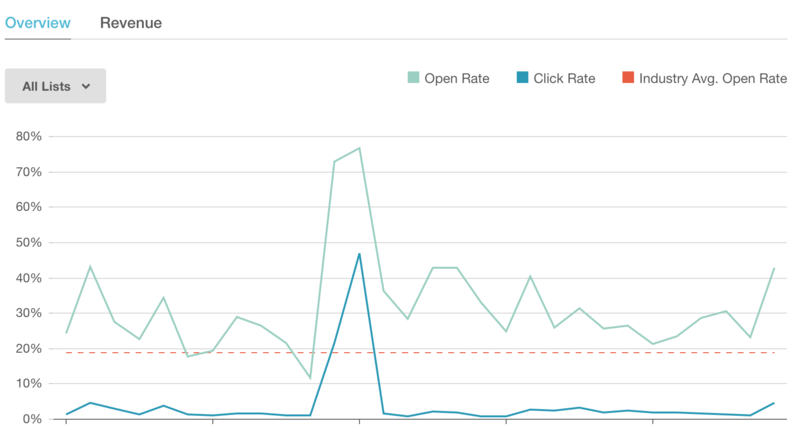 Above are my open and click rates. My clicks are pretty low, but that’s to be expected. Most email efforts result in about 1% in clicks. In a large list that makes economic sense. In a small list it’s acceptable but not very lucrative. However, my opens are very high. People trust my emails to be useful, readable, and fun. If they weren’t I wouldn’t send them. I want to sell books but I’m not a monster. As for mailers, I used MailChimp and SerialMailer. MailChimp is great for mass email and I tend to add and remove lists as necessary. It’s expensive, though, especially if you don’t intend to send out emails every week. SerialMailer is a mail client that uses your own mail server to send out mass messages. Use this at your own risk – Google doesn’t like it when you use their SMTP servers to send more than 200 emails. I tend to use it for personalized emails to short lists of people, about 100 people or so. How did I build up my list? 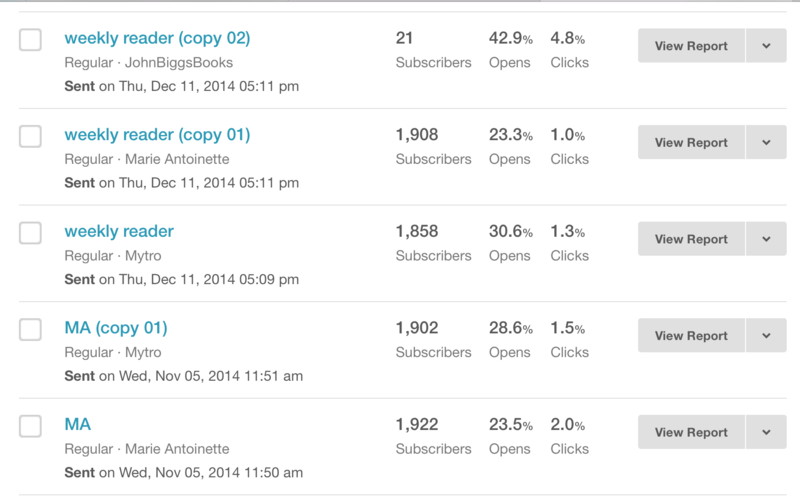 I have a huge contact list which I’ve placed on ice and I am now using SumoMe to gather emails on all of my sites. For example, you can sign up for my monthly book recommendation email here using SumoMe. You’ll also be bothered by pop-ups to subscribe. Please do so and maybe I can stop them! Finally, Sundman asked how long all this took: years. Sadly, I didn’t prepare for the moment I’d become a spammer and I should have been one far earlier. This would make emails from me more expected and less intrusive. If you are marketing an indie book, you have to use email. Period. Look: we writers need all the help we can get. We don’t have distributors, marketers, and PR people – things that traditional publishers should be giving us. We can’t assume our audience is out there, waiting for us, if we don’t contact them directly. We must do this ourselves. I consider myself a spammer but in the nicest possible way. I treat my mailing lists like sacred trusts, a tool that lets me talk to thousands of interested folks in a few seconds. I’m not afraid to use this magical tool but I respect it. I hope that helps. You can read a little bit about my efforts at email marketing my book, Mytro, below. This article originally appeared on TechCrunch. Want to read all Mytro updates? Click here! As I approach the half-way mark of my crowdfunding project, I wanted to address the thing that makes me feel the worst about this whole process: the spam. As I intimated in in my last post, moving from passive content producer to active content salesperson is hard. As someone used to fire-and-forget posting, convincing others to buy something I’ve built is a hard thing to do. And the best way to do it, sadly, is through spam. I pride myself on trying to be a nice guy. I post crowdfunding projects on TC all the time because I think they’re cool and I tend to use social media to either make dumb jokes or talk about projects I’ve seen. Now, however, I have to use social media as a sales tool. I contact the vast majority of my Facebook friends directly, have retweeted comments about the book, and even resorted to contacting my LinkedIn and Google+ contacts although I barely use those services. How did I get the most traction, however?